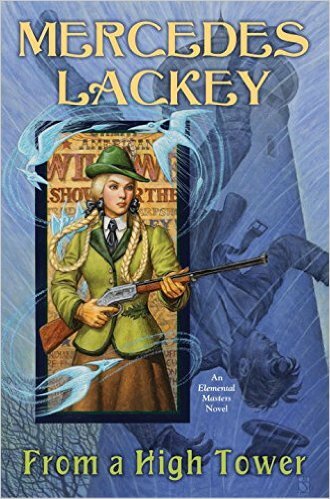 There are things I admired about Mercedes Lackey's From a High Tower, but none of its virtues are enough to elevate it above B-grade pulp fiction. Everything about it, from its slapdash editing to its hokey cover art, smacks of a rush job by a competent genre writer. From a High Tower is a retelling of Rapunzel. In Lackey's version, a young woman named Giselle has spent her entire life in a remote tower in the German countryside, lovingly cared for by her sorceress mother. Giselle has devoted her childhood to learning magic, but when her mother dies she realizes that her otherworldly skills won't keep food on the table. When she sets out to earn her keep, a series of misadventures leads her to the most unlikely of new jobs—as the resident lady sharp-shooter with a traveling circus. Ending two thoughts in the same paragraph with 'I'm afraid/I fear' isn't a major sin, but it's indicative of this book's fundamental problem: it feels like a first draft. A *promising* first draft, sure, but that actually makes it worse, because it's obvious that just a little more effort on everyone's part could have transformed From a High Tower from a generic fantasy novel into a memorable and creative retelling of one of the best-known fairytales in the Western canon.